How much of the past do you need to change to keep everyone you love alive? Twenty-one-year-old Stella, faces some tough life battles, and in her moments of need, she is visited and aided by a stranger, David. She doesn’t know it yet, but she’ll meet him again and again—always when her life is in danger—until one day, she meets him as a much younger man and this time, he doesn’t disappear. He doesn’t remember her or the many times he’s saved her life, but when Stella learns that his life is in danger, can she do what she must to return the favour? Can she keep secrets from the man she loves in her own timeline, knowing it might destroy their relationship? Or change the biggest mistake in her life she has yet to make? What good is having a time traveller as your best friend, if nothing ever really changes? Join the blog tour here! This time travel dilemma means that Stella meets David a long time before she ever tells anyone in book one! Let’s take a look here! Pain runs through my core, and I grab my stomach. ‘This insurance card has expired,’ the receptionist says. Hell, even I feel sorry for me. I thought I’d be resting in a private hospital with nurses to pass me crushed ice and a husband to hold my hand. Leaning on the reception counter, I breathe through the contraction, trying not to draw the attention of the only other person in the waiting room. The pain passes, and I waddle to a seat in my too tight jeans, which have been unbuttoned for the last two months. The man attempts to make eye contact with me, so I keep my gaze on the swirly-yellow linoleum floor and fiddle with my T-shirt. His British accent instantly makes him sound trustworthy. Ha, a trustworthy man. I bite back a smile and nod but don’t raise my head. He leans toward me. He’s older than me, well over the age of thirty, perhaps approaching forty. Heck, everyone in a labour and delivery ward feels older than me, but lots of people have kids at twenty-one. I just hope he won’t look down on me. I would have judged me. People with money hide their age well. His brown chequered shirt and jeans are designer. They might even be next season, but I don’t recognise who. I’ve fallen behind on keeping up with the European designers these past few months. An expensive watch catches the light as he rests his arms on his knees. I check out his shoes. Must be next season’s. Despite being a little ragged around the eyes and sporting a few days of stubble—which of course he manages to make attractive—he’s totally hot for an older man. He’s the type to have a hot wife who only gained ten pounds during her pregnancy and is probably off labouring in a glamorous way. One loud sob bursts from my throat, and the tears follow. I throw my hand over my mouth to stop any more weeping from escaping and calm my breathing before the next contraction comes. The man rises from his seat and timidly sits next to me. It takes two attempts for him to one-handedly pull a stubborn tissue free from the box on the magazine table. ‘I didn’t mean to pry. I meant while you waited on someone. Not alone in the bigger-world sense of things.’ He hands me the tissue and leans back. There’s not much you can say to that. I twist in the plastic, screwed down seat and give him my full attention. How is it people who have everything in life seem to have a sparkle in their eyes? I used to have that shine, until Nathan knocked it out of me. Literally. ‘Sorry for the tears. Must be the hormones.’ Or fear of the enormous task ahead of me. Another contraction rips through me. I bite my tongue and hold my breath to stop from screaming. I throw my hand out and he catches it, allowing me to squeeze his fingers until they turn white. Brona Mills has defied the odds of overcoming dyslexia and failing High School English to become an author. 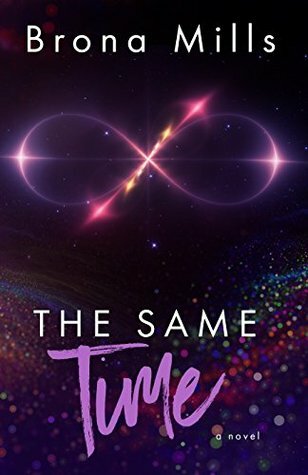 Her first book, A Time for Everything, has been met with great reviews from both the romance readers and the sci-fi time travel lovers, that Brona kept the series going. Book two in the connected series, The Same Time is out 23rd April, and Brona's not stopping there. She is currently working on two other projects, a novella in the connected Time Series, and a new stand alone time travel novel with a dystopian element.